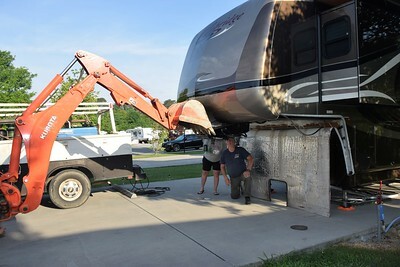 Okay, so Tuesday, Mark & Ken from RVs For Less came down from Knoxville to take the skin down around our pin box. 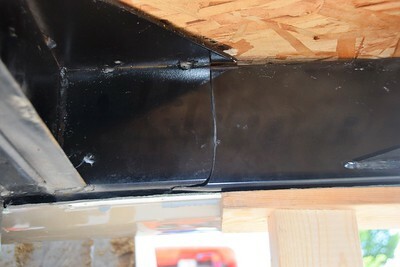 They had to remove lots of screws and pieces of trim and the rubber seals. 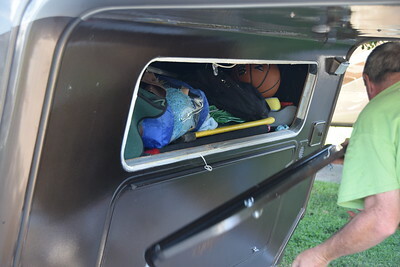 Mark had removed our storage compartment door before Ken had the chance to convince him that probably wasn't necessary. We didn't like watching the process, but it was interesting. 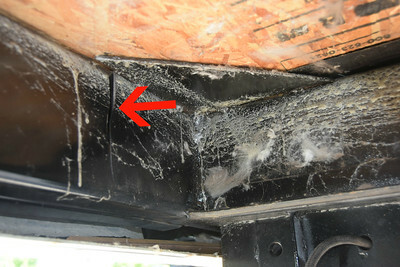 They determined they would have to remove the molded trim on each side to peel the skin all the way back. Eventually it was all peeled back enough to see up inside. and severely cracked on the other. That was the day we started to freak out a little and thought that might be the end of the Cambridge. 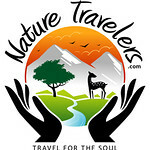 An email from our friends Bill & Debbie, who had gone through almost exactly the same thing last year, calmed us down as did all the other emails and comments from folks that know more about these types of things than we do. 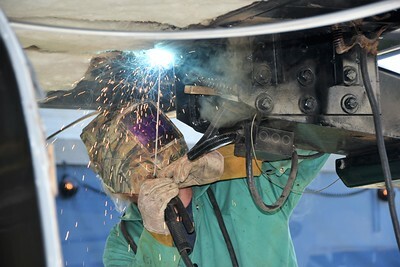 On Thursday, Ken & Butch from RVs For Less met a welder at our site. Randy Marcum is the owner of Martec Metal Fabrication & Welding in Knoxville. 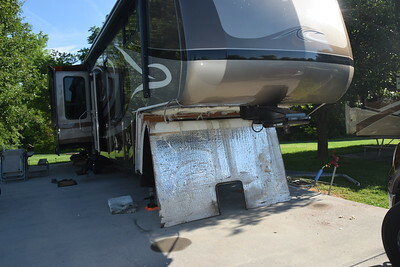 He did an assessment and determined that it would be no problem doing a temporary fix to make it safe enough for us to tow the rig off our site to another site and then on up to RVs For Less for the full repair. We were contemplating having to put the fifth wheel on a large commercial "lowboy" trailer somehow, but it looks like that won't be necessary. The plan was to do the temporary fix at 8:00 a.m. Friday morning. So, here it is Friday morning and the troops are gathering. I had moved our truck and Jeep out of the way. Butch arrived first. Then Steve showed up with River Plantation's backhoe, and Randy (the welder) arrived right after that. Inspecting everything with Butch, I found a piece of quarter round laying in the cap and a piece of trim. That indicated the floor in our bedroom closet had separated. Since our closet is completely full, we couldn't see the gap, but it was clearly there after Linda inspected it more closely. Okay, so the plan was to use the backhoe to put downward pressure on our pin box so that the metal that needed to be welded would go back into place. When they told us the plan yesterday, I have to admit we were a bit uncertain and a little scared we might do more damage. 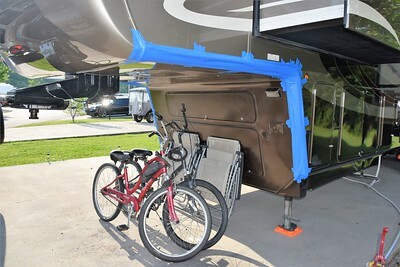 But Butch reassured us he wouldn't allow anything that he wouldn't do to his own fifth wheel. Butch and Randy directed Steve who gently placed the backhoe bucket on our MORryde pin box. Butch and Randy put up a brace just to help keep from putting too much downward pressure. Butch and I took lots of pictures. MORryde has already sent us parts should any need to be replaced on the pin box. Then Randy guided Steve on how much downward pressure to put on the pin box. That part of the plan worked as they expected, and the broken metal came back together. 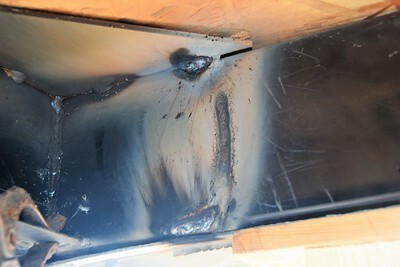 Randy then did his thing welding all the cracks and breaks on both beams. we watched as Steve removed the backhoe bucket and everything stayed in place as it should. We thanked Steve for his time and skill. 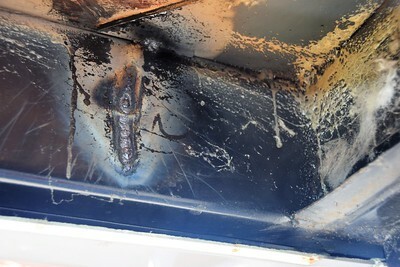 Randy then used a grinder to smooth the welds so he could weld on reinforcement plates. The grinder was throwing sparks everywhere, and Linda became concerned and went inside. Sure enough the sparks were coming up into the closet through the new gap in the floor. We had our multiple fire extinguishers nearby, but took the added precaution of temporarily sealing the gaps with damp towels. While doing that, Linda noticed that one of the particle board walls in the closet was broken. Photos of that later. Randy finished smoothing out the welds and welded on plates to reinforce everything. Of course, he did that on both sides. 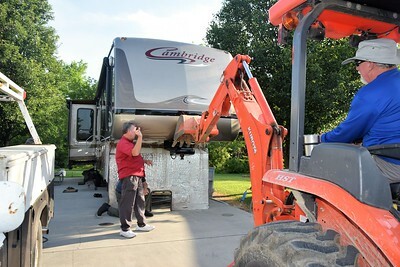 When it was all done, Linda & I were both much more comfortable, and we feel confident that we can tow the rig safely. This temporary fix would likely last us a good long time, maybe even a couple years or so, but we just need to get the rig 45 minutes up to Knoxville so a full removal and replacement of the beams can be completed. We want it to be good for the long haul whether or not we decide to keep it. 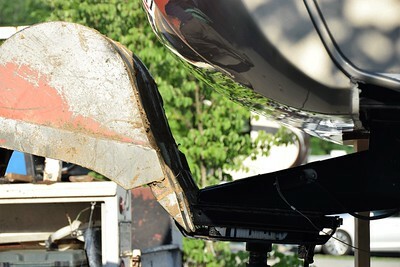 Randy said he would only need a couple days' notice when the big repair is ready to be done. We thanked him and he went on his way. 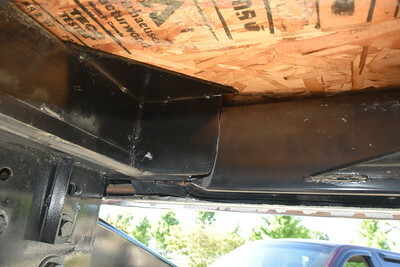 After the welds cooled, I helped Butch put the skin and some of the trim back up. Many of the twelve-year-old screws broke, but we were able to get it back in place well enough to get us to Knoxville in the next week or two. 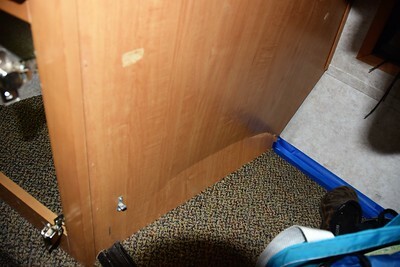 We then put the compartment door back on. 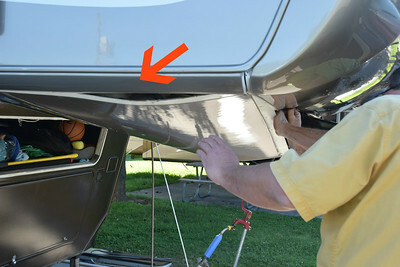 Rather than putting up the painted side moldings, Butch decided to just take them and keep them protected so they didn't get scratched or damaged in the process of re-installing them and then removing them again later. He then used painters tape to temporarily seal everything up. Pretty. On the inside, Linda took up the damp towels, and she used the painter's tape to seal the gap at the back of the closet. Here's a look at the broken particle board wall that separates the main closet from one of the side wardrobe areas. 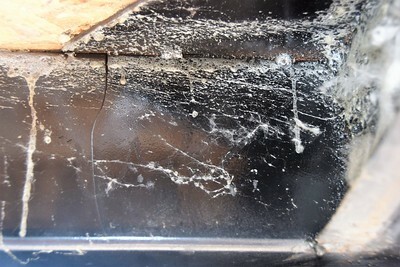 Since there is no evidence of bugs or mice or any other critters that could have gotten through the gap easily, we feel pretty certain that all this damage occurred very recently and probably at the same time the frame gave way. So we're another step closer to getting some resolution on this problem. Fortunately, the people that were supposed to come into our site today graciously accepted a different site a few spots down. Linda walked down and thanked them, and they said it was no problem. River Plantation even gave them a discount for any inconvenience. And the folks that are supposed to get our site next are part of a group and by swapping sites with them, they will be in the middle of their group and we'll be outside their group. So, if that change goes okay we may not have to move until May 29, and by that time we hope to be ready to move our rig up to RVs For Less. Our insurance adjuster has been in touch with them, and he made an appointment to visit us next week. As Charles indicated in the Comments to our last post, a big issue is that they might attempt to "total" our rig given its age and its "book value". So, we hope by the adjuster coming here, we can show him all that we've put into it and how nice it is. Also in our favor is that we have "Replacement Cost Coverage" which means in the first four years of our policy we would have gotten a comparable rig in the case of a total loss, and after that fourth year they would have to give us our purchase price in the case of a total loss. It wouldn't make much sense to total us out, so we'll see where it goes. Once we get our fifth wheel to RVs For Less, we'll need to take everything out of our bedroom and the two front compartments on the outside. They will remove the front cap and take up the flooring to fully expose the upper deck of the frame. Hopefully, they won't find any other damage when they do that. 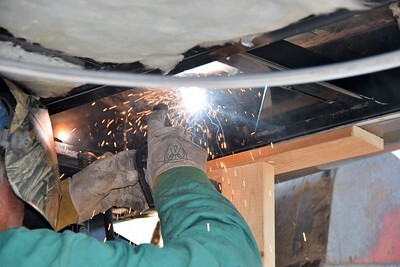 Once the insurance company gives the go ahead, the welder can come in and replace the beams with stronger beams and add several gussets to reinforce all of it. 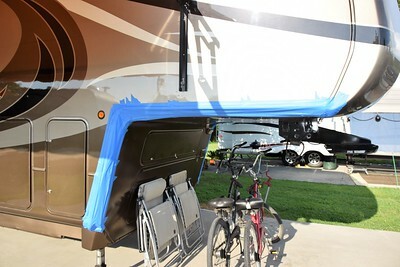 Then RVs For Less will put it all back together (with new screws) and touch up the paint where necessary. It looks like we might be out of our rig for one to two weeks, but we have options. We can stay with friends in Louisville and oversee the sale of my Dad's house while we are there, or we can stay in Butch's fifth wheel here at River Plantation for awhile. If they do total it, you usually have the option to buy it back from them. There are some considerations to doing that, mainly that they are unlikely to re-insure it, so you would have to switch companies. But it it something to consider if they do total it. It is not a big deal to fix the damage that I see. A hassle, yes. But technically it will be better than new if properly gussetted. We are so happy that things are looking up for you. 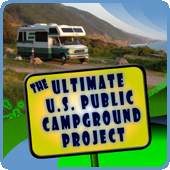 When you have an automobile go to the body shop it is just a slight inconvenience but as you have said many times your RV is your Home and when it goes to the shop it is a major inconvenience. I'm sure that Butch, Karen & Ken at RV's 4 Less will get you all taken care of and back into your home asap. There aren't many dealers that will go to extreme that they do to take care of people. If your rig had to break there isn't a better place too be except maybe at the welding shop. Hope you are repaired and back in your home soon. Glad to hear it can be moved. That must have been horrible to watch them tear up your home. 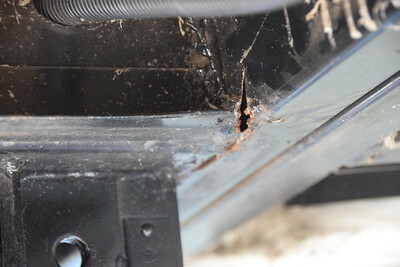 Sorry to read about your fifth wheel frame damage. It sure looks like it will be put back as good or better than new! I still enjoy reading about your adventures after all these years. Good luck! So glad the fix is happening and well on the way to total recovery. By the way, TV placement in a C is usually not real viewer friendly. OMG, this is what is happening to our rig right now. Husband is taking out screws on end cap to try and see whats up. 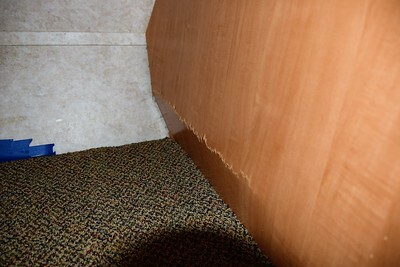 I noticed a crack of daylight in closed flooring is pulling away from front wall end, crack in side of closet. I can feel the screws with my finger in closet. Husband has been in contact with Lippert frame. Scary for me, now I know how Linda feels. Hi Howard and Linda. I think like some other folks the front frame will be better than new with steel and gussets that weren't there when new. You may remember I hand a 33' forest river fifth wheel I pulled with a GMC four door diesel dully. 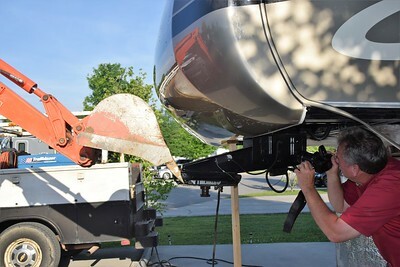 I installed a Trailer Saver fifth wheel hitch (hitch head rides on air bags) in fact I installed the hitch when we were at your first rally in Branson, Mo. and it was in the truck when we went to Alaska in 2009. Never had any trouble with pin box welds. 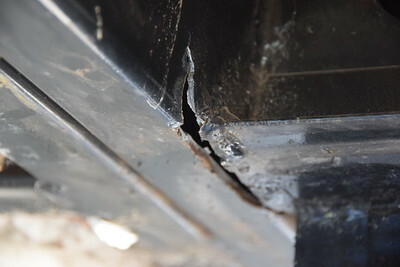 After dropping our front fiberglass I see no damage to the frame anywhere. I going to get another pair of eyes look at it today and may even call in a RV repair guy to confirm what we "do not" see. I started this whole process a few weeks ago by taking measurements suggested by Lippert. Before I seal everything back up I sure would like to know why the side in our front closet looks exactly like yours with the side wall pushed. ??? I feel your pain. This has been a difficult month for us too. Tires on RV, bad diesel fuel and the rear collison of our truck. I'm so glad to be workamping and setting still with the RV. Good luck on your repairs thanks for all ya'll share too. Howard and Linda, Sure glad you were at the CG when you found the problem. As ya'll have taught us, things happen. Good luck on the repairs and Happy Trails. I agree that your frame will be even stronger than when it was new, Howard. 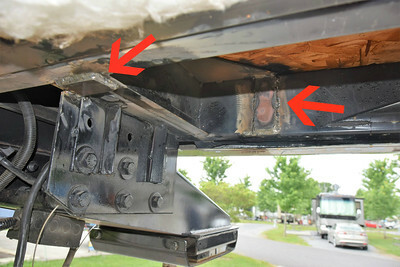 What bothers me is that RV manufacturers know that this sort of failure is an issue. If they are going to build these units to be pulled down the road, then they should make sure it can be done safely. If it adds a grand to the price of the trailer, so be it. How grand it is that you both live and echo how this lifestyle is about the flexibility to flow with the change of the river. Even in the middle of the confusion, possible life coarse changes and with the pause in your spring plans, you continue your gracious gift to teach and share. I think this flow is why you both always seem to be at the right place and at the right time. Heck how perfect was this. Your truck and home safely delivered you by the grace of a few welds, and to a rally of all places. You shared with everyone there your misfortune and perhaps this is why just about every RV there got weighed and we all now know first hand the importance of GVWR. The repairs are amazing given the size of the rig! What I'm finding less surprising now that we've been on the road a couple years, is all the wonderful help and cooperation you've gotten from those around you. Such good folks "out here"!